The easiest decision you'll make all year - our handcrafted Landmark Mission Mirror is a one-of-a-kind piece that will make a statement in any room of the home. Starting its journey as pieces of solid North American hardwood, this mirror is bench built and finished to an heirloom luster by skilled Amish woodworkers - ensuring a piece that is made for a lifetime and ready to be enjoyed for generations once you're ready to pass it down. 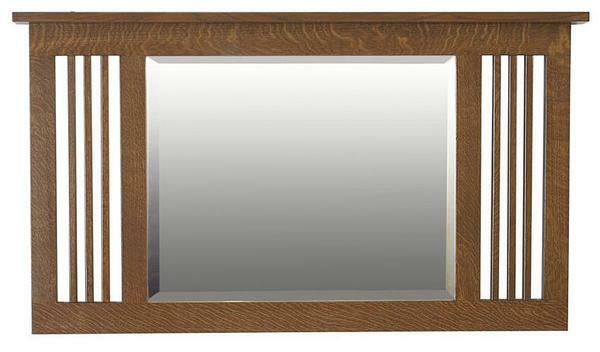 The main feature, an ample 24" x 19" beveled edge mirror, is framed in your choice of three different hardwoods and adorned with a classic Mission slat design on either side. Above, a flat shelve tops the frame to provide a classic look and a place to display special decor, should you choose to do so. With such a quaint, straight line design, the Landmark Mission Mirror will complement any decor beautifully. Just pick the wood and stain combination and your new mirror will be handcrafted to your order. If you're having trouble finding the right combination, please call one of our furniture specialists for a free custom quote on a one-off wood and stain combination. We will provide stain samples to ensure a perfect fit and can help you start your order by phone immediately, to get your mirror started while you decide on your favorite finish. 44" x 2.25" x 25.5"
Mirror - 24" x 19"